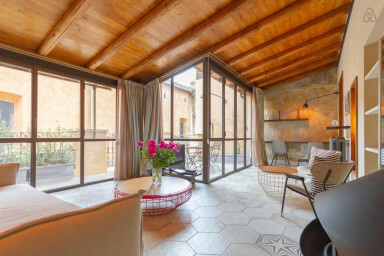 Luxury renovated penthouse with terrace near Spanish Steps. This Wonderful Penthouse completely renovated with design furnitures and very quite is located at the third floor with no elevator of an historic building at only 400 meters by walking from Spanish Steps. Composed by an entrance, master bedroom with queen size bed, complete and very nice kitchen, bathroom with shower, dining room with sleeping mezzanine and an incredible veranda with a comfortable sofa bed and big windows overlooking on the terrace. Perfekt for a antique rom-feeling and the location is near to everything!